Packing: K/D, each part wrapped with EPE and bubble bag and then into an ordinary export carton. 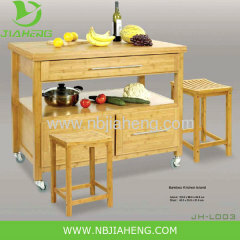 Our advantage: High quality,Sample and usful design, economic and strong structure K/D structure, easy for assembling. Customized orders and new designs are welcomed. Our product are of high quality, which we believe they will meet your demand and satisfy you. 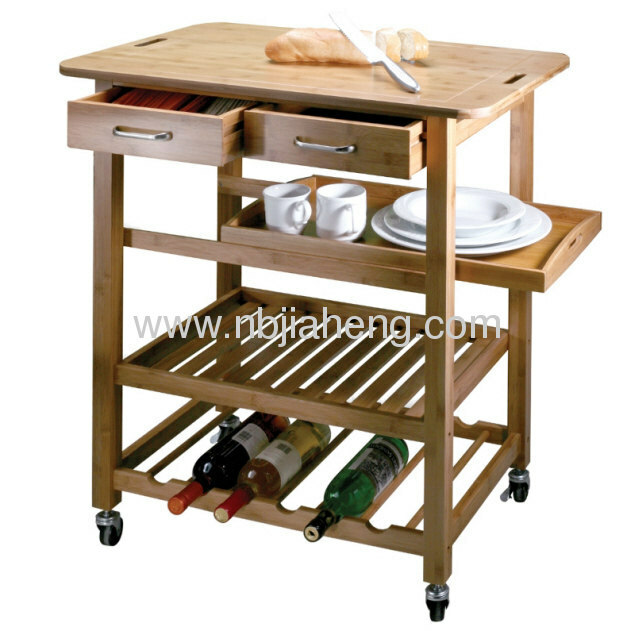 We were curious to see the quality on these kitchen trolleys from natural living and we are pleased to report that they are sturdy and well built. Like many of their products, the trolley is made of solid bamboo, a sustainable product that happens to look great while being durable! 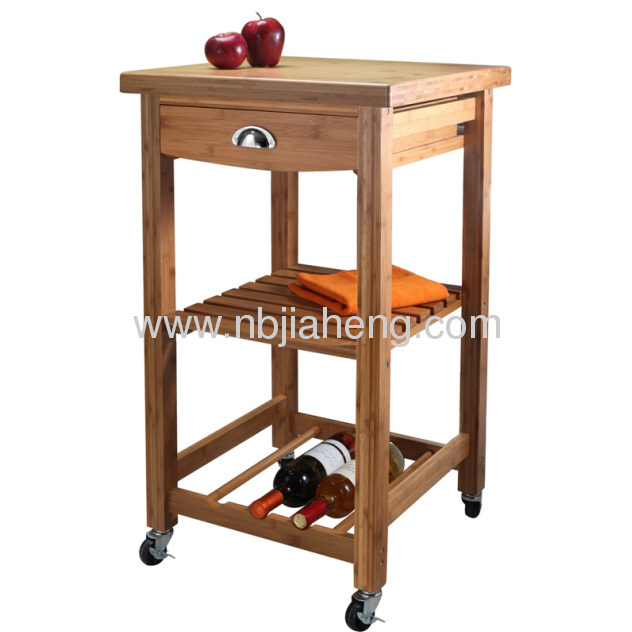 We now have the trolley version in stock for display, and can order both it and the larger island for those who have the space. Pop into the store to check it out, as well as the other bamboo products we carry! Fast growing and eco-friendly, Bamboo is a great choice for green living. Beautiful as well as fuctional, these pieces will be an environmentally-friendly addition to any home. We have been in this business line for many years.Our factory are located in Zhejiang Province ,China. Chinese pine, import pine, rubber wood and solid bamboo are the mainly used material,besides other kinds of wood,such as maple and birch. The products are sold to the markets of Europ,North America,Japan,Korea and Southeast of Asia. a)We are manufacture more than 10 years.Riches resources and have low factory price. Attractive in quality and price,comfortable and fashionable,many sizes for your choice and we can produce them according to your requirements.it is your best choice. 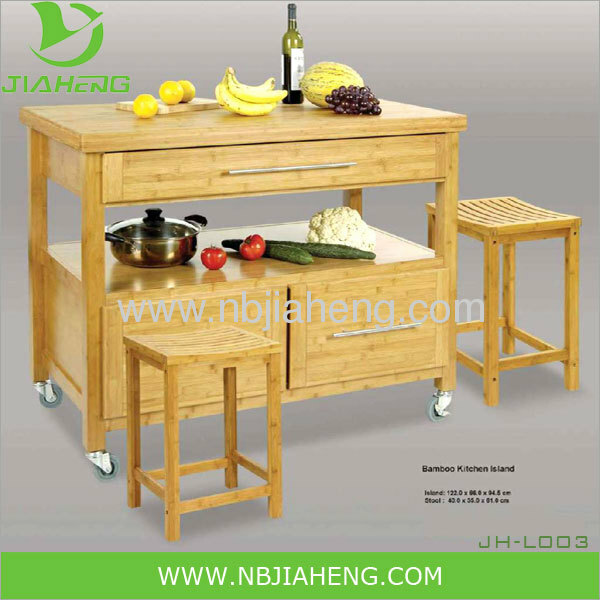 IKEA-style natural bamboo products, after sanding the surface without any chemical treatment, with special wood flavor, with a simple and fashionable, fresh and natural, environment friently, practical and more emotional appeal to the exotic style.